I went to Princeton but somehow I never got to teach my own class, or grade my own work. One wonders how Sotomayor judged her work in that class, and whether the grade helped or hindered her efforts to graduate with honors. Goldfarb's contention would be stupid even if Sotomayor's role in the course was as he described it. But his description of the class is wildly at odds with the reality. For one thing, the 1974 press release touting the course explains that student-initiated seminars were hardly uncommon at the time. Indeed, between 1968 and 1974, 132 such student-initiated courses were approved and offered at Princeton. 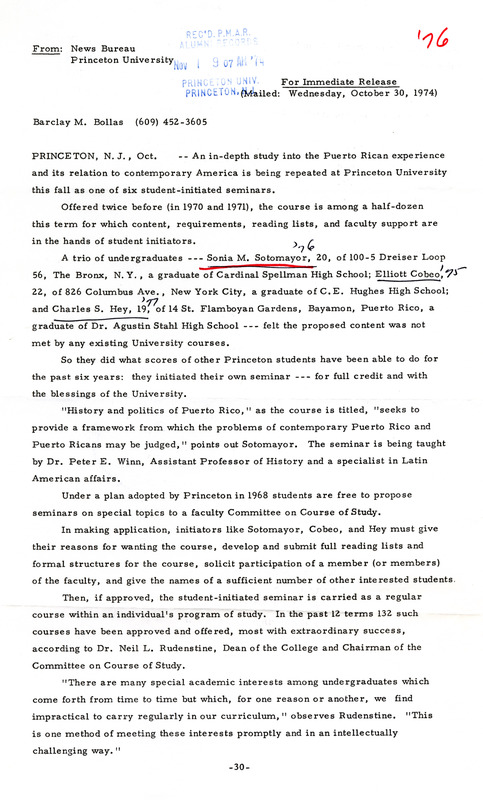 What's more, the press release makes clear that, contra Goldfarb, Sotomayor didn't actually teach the course, much less grade her own work: While the "content, requirements, reading lists, and faculty support are in the hands of student initiators," the press release explains, "the seminar is being taught by Dr. Peter E. Winn, Assistant Professor of History and a specialist in Latin American affairs." So Goldfarb's wrong on pretty much every count. I'm starting to think he's the one who's been the recipient of preferential treatment for most of his life.